The Virunga Mountains (also known as Mufumbiro) are a chain of volcanoes in East Africa, along the northern border of Rwanda, the Democratic Republic of the Congo (DRC), and Uganda. The mountain range is a branch of the Albertine Rift Mountains, which border the western branch of the East African Rift. They are located between Lake Edward and Lake Kivu. 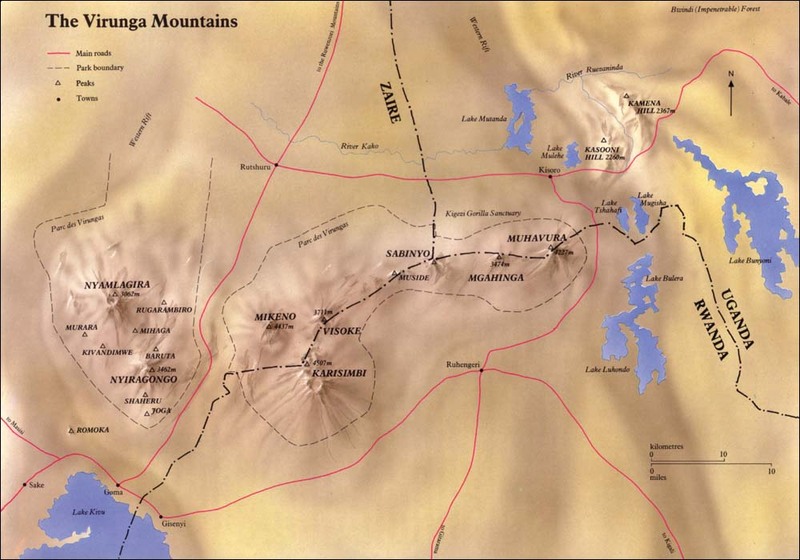 The name "Virunga" is an English version of the Kinyarwanda word ibirunga, which means "volcanoes". The mountain range consists of eight major volcanoes. Most of them are dormant, except Mount Nyiragongo 3,462 metres (11,358 ft) and Mount Nyamuragira 3,063 metres (10,049 ft), both in the DRC. Recent eruptions occurred in 2006 and in January 2010. Mount Karisimbi is the highest volcano at 4,507 metres (14,787 ft). The oldest mountain is Mount Sabyinyo, which rises 3,634 metres (11,923 ft) above sea level. The Virunga Mountains are home of the critically endangered mountain gorilla, listed on the IUCN Red List of Endangered Species due to habitat loss, poaching, disease, and war (Butynski et al. 2003). The Karisoke Research Center, founded by Dian Fossey to observe gorillas in their native habitat, is located between Mount Karisimbi and Mount Bisoke. Michael Crichton's novel Congo is set mostly in the Virunga region. Gorillas in the Mist, and the novel of the same name, document the work and death of primatologist Dian Fossey. The camp from which she operated, Karisoke Research Center, still exists in the Virunga Mountains. Chisholm, Hugh, ed. (1911). "Mfumbiro". Encyclopædia Britannica (11th ed.). Cambridge University Press. Wikimedia Commons has media related to Virunga Mountains.